Of course, we all know that Narasingha Maharaja received all three of his initiations, hari-nama, gayatri and sannyasa, from A.C. Bhaktivedanta Swami Prabhupada, but we also know that Narasingha Maharaja received siksa between 1986 and 1988 from Srila B.R. Sridhara Maharaja, and from Srila B.P. Puri Maharaja between 1994 and 1999. It should also be clear that Narasingha Maharaja never received any sort of re-initiation from either of his siksa-gurus. So what does Narasingha Maharaja mean when he says, “I received hari-nama from Srila B.P. Puri Maharaja, gayatri from Srila B.R. Sridhara Maharaja and sannyasa from Srila Prabhupada”? The spiritual master, the representative or manifestation of the caitya-guru, Paramatma, appears before the fortunate living entity as the diksa-guru (initiating spiritual master) and the siksa-guru (instructing spiritual master). Both the diksa and siksa-guru are to be understood as equal manifestations of the Supreme Personality of Godhead. Having received hari-nama-diksa, gayatri-diksa and the renounced order of life (sannyasa) from that great personality, Srila A.C. Bhaktivedanta Swami Prabhupada, I can never fully express my indebtedness to His Divine Grace, even if I were endowed with the prolonged life of Lord Brahma. Only by the mercy of His Divine Grace, the saktyavesa-avatara of Sri Nityananda Prabhu, do I know anything regarding the science of Krsna consciousness. Srila Prabhuada is remembered as being the eternal servant of Srila Bhaktisiddhanta Sarasvati Thakura, who instructed Srila Prabhupada to preach in English and to print and distribute Krsna conscious literature. His Divine Grace dedicated his life to fulfilling the instructions of his guru and passed those instructions on to his disciples. "Bhaktivinoda Thakura himself has written this (poem) through him (Sridhara Maharaja). Now I am satisfied that after me what I came to say, that will stay, that will remain; I find in these slokas the (proper Gaudiya) siddhanta." The siksa of Srila Sridhara Maharaja is none other than that of the Divine Preceptors of the line of Sri Rupa Gosvami known as the Rupanuga-varga. So much so, that each and every word emanating from his lotus mouth was a gem of Gaudiya siddhanta, his numerous writings are indeed testimony to that. The words of Srila Sridhara Maharaja, both on audio tapes and in book format, are perhaps one of the greatest theological treasures amassed in the 20th Century. When the transcendental vibration from his lips enters the heart of a sincere seeker of truth, one immediately feels the fulfillment of the innermost hankering of the heart – we want Krsna and nothing else. To compile the complete list of Srila Sridhara Maharaja’s glorious siksa is not possible. However, at the top of the list we present Srila Sridhara Maharaja’s commentary on brahma-gayatri known as Sri Gayatri-nigudhartha. 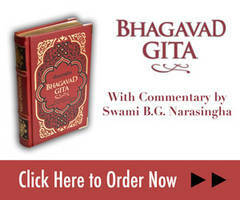 This commentary is the definitive commentary on brahma-gayatri extolling the siddhanta of the Gaudiya Vaisnavas in the line of Sri Rupa Gosvami leading us to radha-dasyam, the exclusive service of Srimati Radharani. This crest gem among Gaudiya commentaries enters the heart and establishes the worship of Srimati Radharani as life’s ultimate goal. Therefore, I say with folded hands that, “I have received gayatri from Srila Sridhara Maharaja”. “With all of your thoughts and heart’s desire, fully engage yourself in the pure devotional service and worship of bhargo, the supreme goddess Srimati Radharani, who is the unlimited origin and possessor of the svarupa-sakti of Krsna, the Supreme Beautiful Godhead (deva). Being the ultimate and all harmonizing potency of Krsna, She remains His eternally unexcelled beloved servitor. In order to fully enrich and promote His lila-vilasa, She manifests Herself in variegated congenial forms. It is She Who manifests Herself as dhama (Goloka) the abode of Krsna, in the form of beautiful effulgence (saundarya-jyoti) and opulence (vaibhava), adorning and glorifying Him all around. It is She who extends Herself as lila-sakti (the potency principle which promotes the bliss giving pastimes of Sri Krsna in variegated colorful, tasteful, mystically opulent and beautiful ways). She is the unlimited ocean of love of Krsna personified (mahabhava-svarupini). Therefore, adore Her as the supreme goal of life, Who gives venerable, blessed intelligence, realization and taste of enhanced loving worship towards Her and Her eternal beloved deva, Sri Krsna, the all fulfillment of life. The sound of gayatri is none other than the divine flute song of Krsna. This flute song is naturally filled with radha-prema and dedicated to serve pleasure unto Her. What is the special characteristic of this all-attractive flute song in the life of devotional aspirants? It deeply attracts all souls to the unending beauty, glories and qualities of His eternal beloved Srimati Radharani, and situates them correctly in their own respective positions in Her eternal ecstatic service. Krsna's flute song thus deeply inspires the devotees to embrace an artist-servitor in the divine service-concert of His eternal consort Srimati Radharani through harmonious service performance. The innermost meaning of this flute song for all devotees is radha-padam dhimah,i which means to wholeheartedly embrace and engage yourself in the service of the lotus feet of Srimati Radharani with all devotional love. The highest and innermost instruction of Sri Caitanya Mahaprabhu is radha-padam dhimahi." The pure devotees of Krsna are the reservoir of all good qualities, but the crest jewel of those qualities is humility. Only those devotees who have developed the quality of humility can constantly chant the holy name of Krsna. Once, in the time of our Guru Maharaja’s grhastha-lila as a pharmacist, he was asked by a Godbrother if he had a formula for the disease of material consciousness. Much to that Godbrother’s surprise, our Guru Maharaja answered that yes, he had a formula, but that he was unable to put it into a bottle. When asked what that formula was, our Guru Maharaja quoted the third verse of the Siksastaka. Indeed, the ahankara (false ego) that binds the conditioned soul to the cycle of endless birth and death is crushed by one who chants the holy name of Krsna with the humility described in the third verse of Siksastaka, trnad api sunicena taror api sahisnuna. This Vaisnava humility is so profound that it is all-attractive, even to the Lord Himself. The heart of Krsna is filled with love for such Vaisnavas. It has been observed by many Vaisnavas, both aspiring and advanced, that Srila Bhakti Pramoda Puri Maharaja was the abode of Vaisnava humility, winning the heart of Krsna and the affections of all those who came in contact with him. Many times we saw the demonstration of Srila Puri Maharaja’s humility and on such occasions it left us utterly speechless. Srila Puri Maharaja was always deeply respectful toward his many Godbrothers. His high regard and deep affection for such Godbrothers as our Guru Maharaja, Srila A.C. Bhaktivedanta Swami Prabhupada and Srila B.R. Sridhara Maharaja was a thoughtful reminder of how fortunate we were to have come into contact with such great souls. It was the profound humility of Srila Puri Maharaja that made this hard-hearted soul understand what was required to chant the holy name of Krsna purely. Therefore, I often say that, “I have received hari-nama from Srila Puri Maharaja”. When my initiated japa beads were stolen, in keeping with Gaudiya Vaisnava tradition to approach a senior Vaisnava to chant on and replace my stolen japa-mala, I requested Srila Puri Maharaja to chant on my new beads. He kindly accepted. Many devotees have lost their initiated beads over time or had them stolen. Usually, as a replacement, devotees purchase new beads and then sanctify those beads by touching them to the representatives of santa-rasa such as the Yamuna, Radha-kunda or Govardhana, or sometimes to the lotus feet of the Deity of Krsna or to the hands of Srila Prabhupada. They do not know that to replace ones initiated beads, it is a superior and desired method to approach a living senior Vaisnava to chant on those beads, rather than going to the santa-rasa section or directly to the Deity. Approaching a senior Vaisnava to chant on one’s replacement beads does not constitute re-initiation as one might speculate, but it does demonstrate one’s own humility and ability to recognise senior Vaisnavas. “Swami Narasingha says, ‘I take shelter of these three divine preceptors, whose lotus feet I constantly adore and remember. ;"